SILVER SPRING, Md. --- A new fundamental belief for the Seventh-day Adventist Church is in the pipeline according to an official statement from the General Conference. Although the exact language of the belief is yet to be crafted, leaders promise that the new fundamental will "ensure perfect consistency and a sweet spirit of harmony as Adventists tackle haystack preparation." "Some Adventist may be upset that we are establishing guidelines for haystack prep but we promise that this new fundamental will put the 'fun' back in 'fundamental,'" said General Conference Director of Creed Creep, Trop de Fromage. Challenges for the new fundamental are already surfacing as church administrators clash over what constitutes "biblically-supported haystack ingredients and their proportions," said Fromage. "Some of our dear brothers and sisters seem to think that Fritos are somehow sacred and can't occasionally be replaced with other corn chips brands or even those really fun guacamole chips. That's just plain wrong." Although countless committees, billable hours and cups of Postum have already been allocated to ironing out the intricacies of the "haystack belief", Fromage says that church resources budgeted for the task will be well spent. Fromage also sought to calm the fears of members that claim the ever-growing list of fundamental beliefs contradicts the simple vision of Adventist founders. "We realize that we started off as a young and nimble church that did not believe in something as stodgy and settled as a creed," said Fromage. "We just need one last fundamental to get it right." I like the GC Director of Creed Creep’s name, “Trop de Fromage.” Yup, the GC will likely assert there’s “too much cheese” in the average haystack. IN ALL YOU DO (OR EAT) GIVE THANKS TO THE LORD. This may be satire, but it conveys a serious truth: “the ever-growing list of fundamental beliefs contradicts the simple vision of Adventist founders.” The founders eschewed credalism and believed that truth is advancing, not static. The problem is not only the proliferation of beliefs, but the fact that they are proclaimed to be “fundamental.” They might be important, but it’s hard to imagine having 28 truly fundamental beliefs. I think only three beliefs are really fundamental: 1) I believe in, and love, God. 2) I accept Jesus Christ as my Savior and Lord. 3) I want to love my neighbor as myself. Amen Manny. The SDA church has become glutenous in its yolk and its desire for all of us to bear it. Yes three beliefs are the only true salvation related commands. The sabbath is great but if were that GREAT, Genesis would have been flooded with it. But it is not. Worse yet. This past GC session also decided to substitute words to conform to modern times and political correctness, for example human instead of man. Look for the official SDA bible soon. Anything else will be wrong. I’ll wager to say that context will be changed to support SDA belief. There already is an SDA bible, its all “my” collective works. Seems to me, fundamental beliefs would have been ID from day 1. No need to pad them on. On a separate note, I’ve never had haystacks – never spent enough time in the US. Adventists don’t know it where I am from. We were tortured by gluten as a meat substitute in Pathfinders. Are haystacks that good? Also, are they even really that healthy? How truly “healthy” can they be if they have Fritos or corn chips? Haystacks are amazing!! Maybe Loma Linda Foods (or Worthington or Morning Star) can create an all-in-one package, a “Haystack Kit” if you will, for export to haystack-deprived portions of the globe! You’d probably have to add lettuce and tomatoes locally, but that shouldn’t be a problem, right? Well, in Antarctica, maybe. THEY ARE EVEN BETTER IF YOU ADD FAJITAS TO EM, OR ROASTED LAMB WHICH OUR GOOD LORD ALSO LOVED. Also loved fish as I recall …. I know they had fire – so smoked salmon would be a natural! Humans have a tendency to expand rules and multiply regulations. Take the U.S. Tax Code, for example. . . . Reminds me of the 613 mandatory rules of the ancient Jews. Given enough time, the SDA Church can be expected to tack on a few hundred more rules and beliefs, too. THE GOAL IS TO SLOWLY REACH THE IDEAL NUMBER OF 1844. Haystacks a wonderful, but we don’t need a Fundamental Belief doctrine about them–or about a lot of other things, for that matter. Oh for the good old days when the pioneers had simple beliefs. Even better, oh for the days of Jesus who said the great commandments were simply to love God and people. Forget haystacks. Try some finger-lickin’ soy Fri-Chik! I’m a proud Presbyterian, and I “don’t know about” Adventism, but I have a suggestion: haystacks are “too Mexican.” Don’t adopt the Haystack Doctrine; try making a new Fundamental Belief # 29 about the Great Wall of Mexico. You can even add it to the Baptismal Vows: “I believe in the Great Wall of Mexico and the separation for which it stands.” And remember to vote for me in 2016: The Donald Dump. I HOPE YOU WIN DONALD. THE US LEADERSHIP IS MOSTLY PANSIES. NEED MEN OF VALOR WHO ARE NOT AFRAID TO FIGHT. AND BARRRRRRRAK, JEES, WHAT A JOKE. BUT I WOULD NOT MIND IT IF HE WERE MY BUTLER. My wife was an Adventist, so vote for me to be your “Haystacker in Chief.” I’ll be sure to put haystacks on the White House menu. After all, everyone knows that Daniel, Shadrach, Meshack, and Abednego refused to eat the king’s delicacies and insisted on eating haystacks. I love to go on a “haystack fast,” where I don’t eat anything except haystacks. It’s not much of a burden (and I hardly feel like I’m fasting) because haystacks make quite a complete meal. If you’re still hungry, you can eat a few Little Debbie’s to tide you over. 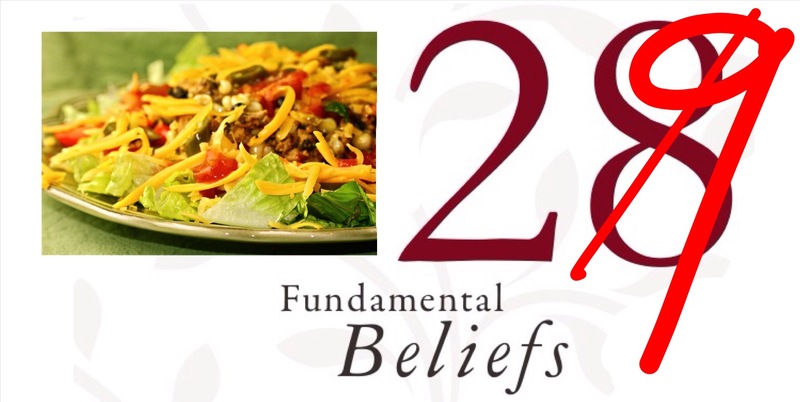 Will fundamental belief # 30 be about Special-K Loaf, or Postum, or Vega-Links? I can’t wait to find out! Sevvy is a very talented writer. Instead of purveying the nonsense satire on this site, why doesn’t he write something of true value and worth like raunchy rap song lyrics or Ben Carson’s hip-hop commercials? Wrong. It’s not 144 boxes; it’s 1844 boxes of Little Debbie’s per month.